This afternoon's red post collection includes a heads up that the new Champion Mastery system is being enabled on live servers, a note that the EU/NA LCS Spring Split summoner icons will be leaving the shop on May 8th, a reminder that the MSI summoner icons and sales are now available, ManWolfAxeBoss commenting on ARAM's new Mark/Dash summoner spell, and more! 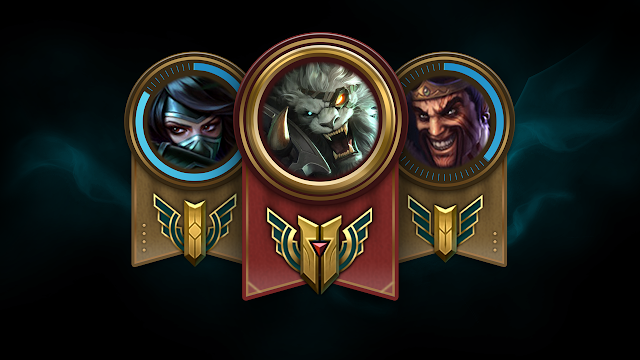 As previously announced, the new Champion Mastery system is being rolled out to live regions! Check out the Champion Mastery microsite for the full story or head over to the Champion Mastery FAQ for more information!" It's rolling out in SR on normal (blind/draft), teambuilder, ranked and ranked team queues." "We've finished NA, EUN, OC. EUW should be next, along with RU and TR." "It won't be until much later this evening (5+ hours). We're making sure everything's running fine in NA then we'll roll out to other regions." Riot Chomey also noted that Champion Mastery will be up on LAN/LAS later today. Because Leauge of Legends is the most played PC game in the world, it's never as simple as pressing the big red "release feature" button. Different divisions of Riot have to make sure everything is optimized in terms of localization, not to mention the various different clients (i.e. NA vs. Garena's). Yes, and something like this is new hardware in each data center. Lots can go wrong!" "It's based on your performance, your teams performance, the length of the game, win vs loss and a few other factors." Riot Mirross also reiterated that Champion Mastery will be launching for SR ranked, normal (blind/draft) and team builder. "We're releasing in SR ranked, normal (blind/draft) and teambuilder." It should be correct in the client." "The titles are based on the primary role of that champion (i.e. each champion has one set of titles defined for him/her)"
"So, I posted a couple days ago about a change that's already on PBE. The damage is being split between between Mark and Dash. It will only hit for about 1/3 on Mark now and 2/3 if you commit to Dash. The spell is too "pokey" in its current state, which isn't the goal. This tweak should help address that while still giving tools to champs that want to gap close. As I stated the other day as well, we're keeping on eye on the spell (cooldown in particular) and will adjust things as needed." "Yup. We are thinking the same thing. Having windows in which players can both relax and make aggressive plays is important. We're leaning towards increasing CD, but the spell has only been on live for a week. Frankly, that's not enough time to make an informed decision. Again, it's all on watch and will be addressed as needed." Following his enormous discussion on the Tribunal and other player behavior systems, Lyte also commented on reddit that om the future Honors will identify players for positive reviews in the Tribunal. "In the future, Honors will identify players for "positive review," and players can vote on their chat logs. If the community agrees the players are positive, players who accurately Honored the positive player, players who accurately voted the player as positive in the Tribunal and the positive player themselves will get a small prize. There will be clear feedback loops throughout, so it should be a pretty good reinforcement loop for the system. Of course, there's also a few design upgrades we want to do, but we're going to finish up the first few features of the new Tribunal first before we start talking about the positive feature set." With the LCS Summer split starting up soon, the EU and NA LCS Spring Split team summoner icons will be leaving the shop on May 8th! "The 2015 LCS Spring Split has come to a close. As we gear up for the Mid-Season Invitational and Summer Split, we’re doing some shop keeping and taking down the NA and EU Spring Split team icons on May 8. Make sure to grab them for 250 RP each before they're gone to support your favorite team. Watch out for the Mid-Season Invitational icons and upcoming Summer Split icons, freshly updated with all the new teams joining the LCS." While most teams will be returning for the LCS Summer Split and have a new icon, Winterfox, Team Coast, and Meet Your Makers will not be returning and this will be your last change to snag one of their icons! The 2015 Mid Season Invitational is starting up soon and the previously announced summoner icons, bundles, and discounts are now available in the shop! Snag some esports-inspired Summoner Icons available from 11:00 PDT May 5 through 23:59 PDT May 19 . What regional meta will triumph? Show your support for your favorite regional league with an icon from the six regions participating in the 2015 Invitational. If you love all the regions equally (or just can’t pick your favorite), grab the official icon of the event. Our panel of shoutcasters weighed in to predict what champions will be most impactful during the Pick/Ban Phase of the 2015 Mid-Season Invitational games. Grab two rune pages for the price of one on both RP and IP! Level up your IP and XP gains! All boosts are 50% off! Show your allegiance to your region or favorite team with a name change for 650 RP, 50% off the normal price. Get rewards for watching the 2015 Mid-Season Invitational. If a player at Mid-Season Invitational gets a Pentakill or Baron steal, it’ll trigger a Mystery Gifts bonus and it’ll double your chance to unlock esports team (Fnatic, TPA, and SKT), championship, and legendary skins through 23:59 PDT May 15."